WPI manufactures "Off-The-Shelf" and "Made to Order" high quality spectroscopy fiber and fiber probes. Examples such as transmission dip probes for protein DNA/RNA Quantification, UV Raman Probes for in situ environmental testing of PAHs in aqueouos systems, fluorescence probes designed to detect pH and membrane portential, to standard fiber patch cable to couple to fiberoptic spectrometers, sources and accessories. 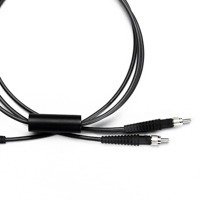 In need of an fiberoptic cable or a custom fiber assembly that's not on our website? Simply visit the link below to request pricing and/or speak with one of our specialist. The transmission of conventional UV-enhanced silica/silica fiber decreases rapidly at wavelengths below 240nm when exposed to high intensities of a deuterium lamp. This effect is called UV Solarlization. It results from the generation of color centers in the fiber material. The lifetime os such an optical fiber, defined by the 1/3 reduction in transmission at 240nm, is normally less than 200 minutes. This effect renders them unsuitable for UV spectroscopy below 240nm. Anti-solarization fibers suitable for deep UV spectroscopy solve this problem. These fibers stabilize to less than 5% degradation over a period of 20,000 hours after an initial transmission "burn in" loss of less than 25%. Additionally, this anti-solarization characteristic will not degrade over time. Use bifurcated fibers to combine similar intensity light from differing sources or to split a light source into two fibers. These are for use with a dual spectrometer as a reference. Plastic optical fibers are more flexible than glass fibers. These inexpensive PMMA plastic fibers may be used for illumination and scientific applications. They are excellent for light transfer between 350nm and 1000nm. Their maximum temperature should be kept below 80°C. Our standard optical fibers have broad UV and VIS spectral range. They are resistant to laser damage. They have a high core-to-clad ratio. The are composed of bio-compatible material and offer a broad temperature range for operation. They offer higher transmission than PCS between 180nm and 300nm. Research lab equipment for where science takes YOU! All the instruments for where the science takes you. NOTE: As stated in our Terms & Conditions, WPI laboratory equipment and surgical instruments are not intended for use on humans. Copyright © World Precision Instruments. All rights reserved.